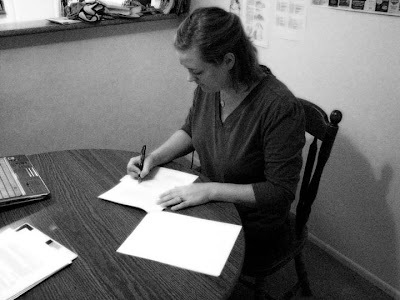 Today I signed my contract and sent it to HarperCollins. I know it might seem a bit late for all of that, but it took a long time to get the contract smoothed out. In fairness to my agent, she had it ready for me to sign well before Christmas. But silly me, I had some questions I wanted to ask first, so I had to wait until everybody was back from the holidays. Yesterday I asked my questions. K, as usual, answered beautifully. (I seriously think I could watch K muck horse stalls and still think she was one of the most amazing people ever.) And so today, I officially signed my life for the next few years over to HarperCollins. And now they can officially pay me. Woot! I also got some notes back from F today. Now, I've been waiting for these notes for a while now, and I was completely out-of-my-mind excited to get them, no matter what. I like revision--most of my published short stories are far, FAR different from their first drafts. There are two types of revision, I tell my students. The type where you come into the room and rearrange the furniture and dust the cobwebs and then stand back and admire the nice, tidy place you've made for yourself. And the type where the contractor informs you that the wiring is shot, and most of the walls will have to be torn down, and before you know it a sledgehammer is swinging wildly through your work. This is the part in all the home makeover shows where everybody has just a little too much fun destroying the old kitchen cabinets. And after the dust settles and you've carted all the junk to the dumpster, you roll up your sleeves and start rebuilding. When you're done, the place is at a whole new level of beauty, something you never even imagined before. I'm all about type 2 revising. Really. And I intend to have a good attitude with F, as in confident, hard-working, amiable writer. But when I read the notes, I vaulted straight into wallowing. Which I understand is completely irrational! When I read the notes now, a few hours later, I see the genius in F's ideas, her expertise at work, making the story tighter and stronger and better. She's not asking me to rewrite my book from scratch or cut something I absolutely loved or anything terribly drastic. But for about an hour after I got the email I stumbled around our apartment with a sheen of tears in my eyes, nauseated and stunned. I told my husband that it felt like I'd been hit in the stomach with a two by four. He had the good sense to hide his bafflement at my odd emotional reaction and just give me a hug. And now, I'm back. Rational once again. Excited once again. Which is good, because tomorrow morning I am going to meet F in PERSON for breakfast!!!! Oh, Cynthia, you are terribly brave! I'm sure your remodel will be stunning. Congrats on your contract! It's fortunate that you let yourself have a little time to wallow after the tough comments came in, AND that you actually like the into-the-wallboards type of revision work. That's what's toughest for most writers! I love getting revision suggestions from agent and crit partners. Hate trying to come up with ways to revise myself. Congrats on signing the contract! Congratulations Cindy! A lot of hard work paying off, a long road traveled and in some ways just beginning. Kudos on the new book, revisions are never easier, but like a lot of things -- make us stronger.